A book review blog for books that are not on the bestseller lists, but still deserve attention. The artist Jackson Pollock was famous for his "action paintings", in which he would tack a large canvas to the floor and drip, splatter, and smear paint across it's entire surface. It was the act of painting that was important, not what (if anything) the painting showed. His work was performance art, using paint as a medium. He even went to the extent of titling his paintings by number, rather than assigning names, to avoid preconceptions by the viewer. There are people that can look at a Jackson Pollock painting and see something, who are able to coalesce the random spattering of paint into a theme or a concept or even a scene. Personally I believe this is more a function of their own consciousness, not the intent of the artist. For Pollock, the activity of painting was more important than what was being painted. 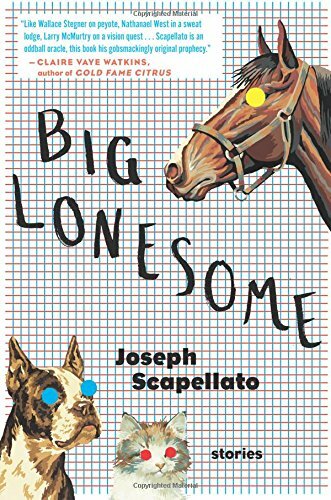 Joseph Scapellato's collection of short stories, Big Lonesome, swings between episodes of the real ("Immigrants", "Company"), to random gatherings of words, dripped onto pages apparently left lying on the floor ("Horseman Cowboy"). In the first case, the object is clear to anyone that reads it. In the second case, the reader's ability to discern a message may rely more on wishful thinking and a desire to see something where nothing exists. The mere act of putting words (or paint) on paper does not automatically make it art, or provide it with meaning. At its best, Big Lonesome provides us with a montage of dispirited characters, coping with the small, individual loneliness that is human existence, and he manages to do it in a distinctive and incisive manner. The "surreal" bits in between intrude into this fabric, but without the redeeming quality of providing a counterpoint. They seem to exist simply to create a perception of artistic merit, but instead appear more like 'Magic Eye' paintings that have been hung among the Masters in an art gallery. If you squint your eyes and tilt your head just right, you may see something, but in the end it diverts and distracts rather than enlightens. I find that there's a certain "weighing-in" that goes on when I am confronted by a lengthy new book. Part of it is, no doubt, a holdover from the English classes I took in high school. Just when you thought you might actually see the bottom of the pile of homework, a masochistic teacher would assign "War and Peace" to read and report on in two weeks (my apologies to Tolstoy). Even without that hanging over my head, there is still a hesitation to embark on a drawn out literary expedition. Reading is a hobby, hopefully an enjoyable one, but it does require an expenditure of time and attention. Obviously, a longer book takes longer to read, but there is the added effort of keeping track of more characters over an extended plot line. In short, it becomes work, and leaves the reader hoping that the author will help along the way, and the payoff will be worth the labor. In the case of Claudine Bourbonnais' debut novel, Metis Beach, the rewards did not quite compensate for the effort. What the back matter copy describes as a "historical epic" and a "chronicle of the great American Sixties" was a lengthy, meandering story of a young man's journey across two countries over the course of three decades. There were brief nods, Forest Gump style, to landmark events like the March on Washington, but the characters serve more as observers than participants in this larger picture. The result is an unhappy melding of a coming of age story (worthwhile on its own merits) with almost random historical events. Whether this was an effort to set a place in time for the story, or to try to link the character's haphazard progress with the growing pains of American society, I'm really not sure. I suspect that it was both, but in the end Metis Beach accomplishes neither. Having grown up in the Sixties, to me the references seemed impersonal and detached, as if they were culled from newspaper headlines rather than experience. They end up detracting from the personal aspect of the story, rather than adding to it. Sometimes less is more, and I think Ms. Bourbonnais may have bitten off more than she could chew. The story of Roman Carr/Romain Carrier actually would stand better on its own, shorn of the historical references. 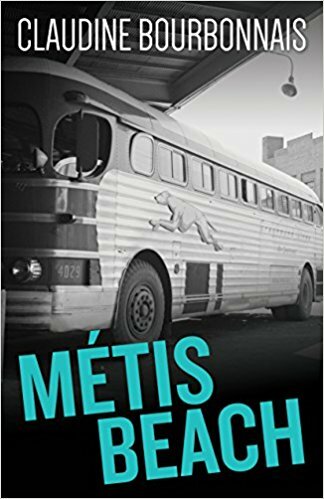 That would still leave plenty of meat on the bone, so to speak; buried in Metis Beach is an excellent character study, as well as a view into the Canadian French/English dichotomy. Sometimes the measure of a book is what the author leaves out. Hemingway turned his minimalist realist eye on the Spanish Civil War novel For Whom the Bell Tolls, and opened the door to a world unknown to most Americans. In Drought, Ronald Fraser picks up where Hemingway left off, historically and stylistically, and gives us a view of Spain where the echoes of the Civil War can still be heard. Old animosities lie hidden, but are neither forgotten nor forgiven, and the trust between neighbors is still a tentative thing. Writing in a spare style reminiscent of Hemingway, Fraser has penned what can almost be regarded as a sequel to For Whom the Bell Tolls. Parallels exist between the characters of both novels, including the foreign protagonist. Just as the bridge played a central role in Hemingway's tale, Fraser has a dam to do the heavy lifting. Hemingway's "iceberg" storytelling style is evident in both stories; the reader must divine motives and personalities from the actions and dialog of the characters. And so the question becomes, is Drought the heir apparent of For Whom the Bell Tolls, or is it simply fan fiction? 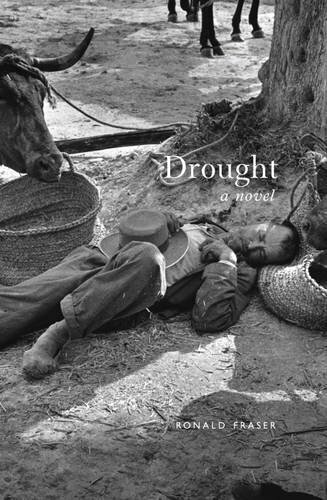 I just finished my second reading of Drought, with my copy of Hemingway at hand, and I will admit the comparison is favorable. Fraser may not be a match for one of the masters of American literature, but he has certainly given us more than a shadow of his intent, and a clear but fleeting echo of the master's voice. "You're traveling through another dimension, a dimension not only of sight and sound but of mind. A journey into a wondrous land whose boundaries are that of imagination. That's the signpost up ahead - your next stop ..." ... The Joyride Zone! For the majority of people, San Diego can be defined by the "high points": Balboa Park, the San Diego Zoo, the waterfront, the beaches. The farthest afield most people get is the San Diego Zoo Safari Park in the northern part of the county. I'm not just talking about tourists - many San Diego residents probably don't go much beyond the perimeter defined by their home, their work, and their favorite activity, and the network of freeways that connect them. Author Jack Brandais is a native San Diegan, and he has made it his particular mission to find, and to chronicle, those spaces in between the high points. The counties of Southern California are among the largest in the United States, and San Diego County is no exception; there are lots of places in-between. For those of us who were born and raised there, those places, and the narrow roads that take you there, are an indelible part of San Diego history. 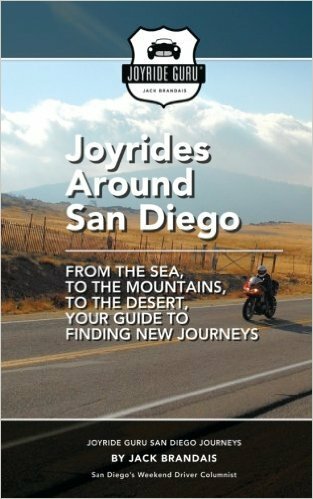 Joyrides Around San Diego is a compilation of Brandais' Kindle driving guides covering San Diego County from the Pacific Ocean to the Borrego desert. Now, I don't have a GPS in my car, and I still use paper maps, but the Kindle version has certain advantages. There are live links to take you to websites with background information, color pictures ... it's interactive. On the other hand, the new "hard copy" version has all 10 San Diego Joyrides in one convenient package. You can browse it at your leisure and pick out a destination for the day, or plan a weekend getaway. You can leave it in your glove box and it never needs batteries. And if you want to see that background info, the author has put the links on his Joyride Guru website for your convenience. Either way, you get driving directions, handy maps, a list of sights to see, and a bit of history to boot. If you're new to San Diego and really want to see San Diego County, this is the place to start. If you're an old-timer like me, this is a great opportunity for a trip down memory lane, literally. Batteries not included - or needed! What happens when a person's perceptions of the United States are determined by watching vintage American Western movies? 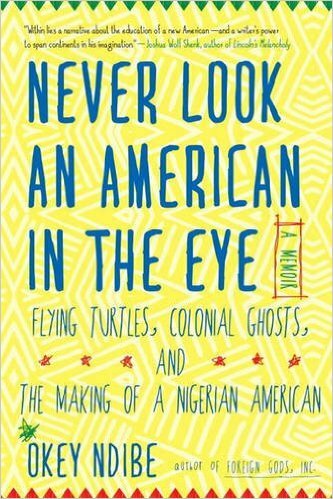 The result is Never Look an American in the Eye, Okey Ndibe's multi-faceted tale of his immigration to the U.S. in 1988. Ranging from the humorous to the sharply serious, Ndibe uses a series of anecdotes to explain how and why he chose to leave his native Nigeria, and what happened on his arrival here. American culture is disseminated to the world in often enigmatic ways. Often it is through media, particularly television and movies. Needless to say this can give viewers on the other side of the world a very different idea on what the "real" America is like. The result can be a shocking wake-up call to the newly arrived potential citizen. Ndibe does an excellent job of conveying this inevitable culture shock, and the emotional effect it can have on the hopeful immigrant. Between his stories of feeling lost in the swirling tide of new sights and experiences, he also injects bits of humor: the similarity between the pronunciation of his first name, Okey, and the common English exclamation "okay" leads to some exchanges worthy of Abbott and Costello. Examples of American misconceptions about Africa and Africans also serve to lighten the mood while illustrating our cultural indifference. Amd the mood can be exceedingly dark as well. His tale of being the victim of racial profiling by the police, hampered by his less than perfect grasp of the American justice system (he thought he was being questioned for looking the policeman in the eye) echoes an uncomfortable reality for many Americans, not just the most recent arrivals. Throughout this portrayal, Ndibe reinforces the certainty that underneath the cosmetic differences, we are all people just trying to make our way. Towards the end of the book, where he relates the death of his father and his return to Nigeria for the funeral, we see a fellow human being, dealing with the pain and emotion that cuts across racial and ethnic lines. Never Look an American in the Eye points out our preconceptions about immigrants and immigration without beating us up with them, but refuses to ignore them. The United States is an immigrant country, yet we sometimes turn a blind eye to that fact. Okey Ndibe reminds us that there are still people around the world who dream of a better life in the United States, just as our forefathers did, and that they have much they can contribute to our country and our culture. One of the downsides of being an Amazon Vine program reviewer is that there is a time limit for submission of reviews. As a consequence there can be an unconscious urge to quickly read the book, quickly deciding whether or not you like it, and quickly writing a review. It's easy to get caught up in the numbers game of having the most reviews and getting a high ranking, which means you need to read as many books as quickly as possible. And most modern fiction makes that possible. Short sentences, uncomplicated characters, and clear and concise plots make for fast reads. 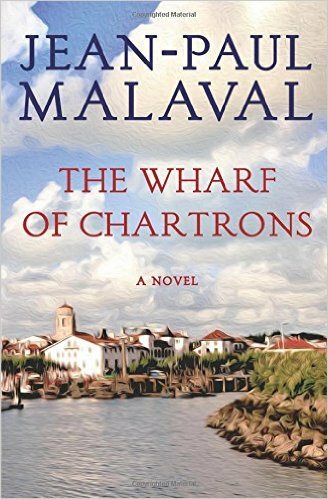 The Wharf of Chartrons can be a challenging read if you are used to the formulaic writing of the James Patterson school of fiction. Not that there is anything wrong with James Patterson - I used to read him back when he wrote his own stories. But my tastes have matured, I want more than a clean, crisp story with a big finish. I want subtlety, complexity, finesse; like a good wine it should be intellectually satisfying. As noted, Chartrons was originally published in French. I did not have any difficulties with the translation, but it has kept its French aroma and flavor. The pacing is slower, more like a European meal than a stop at MacDonald's, full of subtexts and nuance. It is a period piece, and I found the language and plot were appropriate for the time and place. The Industrial Revolution was arriving in a cloud of smoke and noise, the old ways were dying, and not everyone was happy about it. I found Chartrons well worth the time it took to read and savor it. Like "Joyride Guru" Jack Brandais, I too am a second-generation San Diegan, and spent many a weekend with my mother and brothers on the road to Julian (or points east). I was anxious to see if the trip has changed much over the years, or if it still matched up with the memories of more than four decades ago. I was glad to see that, other than a few more buildings, the route has retained a good deal of its original character. You can still catch glimpses of San Diego County as it used to be. I was glad to see that Dudley's Bakery was still in business; it was a favorite stop, especially if I could talk my mom into getting me a donut. Their bread is the best! In addition to the sights along the highway, the author includes some of the back-country routes that my family "discovered" over the years: the Old Julian Highway, Wynola Road, and Farmer Road. You can while away an autumn afternoon just wandering the side roads - it's especially enjoyable when the leaves are turning and the air is crisp as a Julian apple. Just mind your manners and be sure the road you're on isn't somebody's driveway. And of course, save some room for pie. I like mine warm, with a scoop of vanilla. 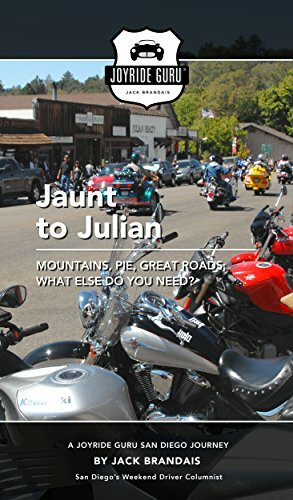 I'm old-school, and to me a map is an intricately folded sheet of paper, but Jaunt to Julian covers everything you need to know for either a day trip or a weekend getaway. Hyperlinks provide specific information on sights and side-trips (for casual hikers I recommend the Santa Ysabel Preserve), and there are interesting notes on the history of the town and surrounding areas. Copyright KnC Books, 2004-2016. Simple theme. Theme images by sndr. Powered by Blogger.